We hear some version of this line from nearly every parent who comes to DM Ed for consultation or solutions for their child’s reading difficulty. And they are right. Studies have shown that dyslexia is completely unmoored from general intelligence. Children with reading difficulties have normal or above average IQs. It can be heartbreaking to hear as a parent, especially when you know it’s not true. If your child is old enough to understand it, perhaps show them this graph from the Yale Center for Dyslexia & Creativity found here. The top line in both graphs is IQ, which you can see nearly exactly matches in both images. 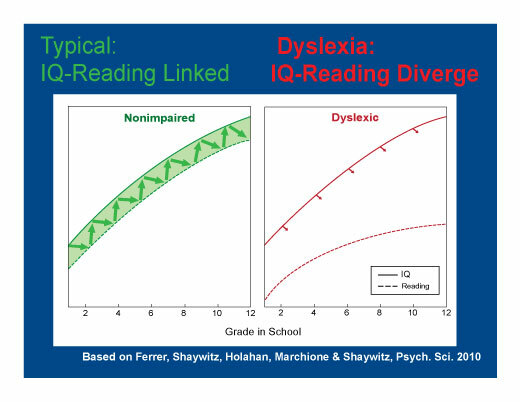 Reading difficulties and dyslexia are very rarely linked to IQ – and it’s vital that both parents and struggling readers understand that. More on the true causes of dyslexia is available here.